Maldives Gas and Prison Cooperative Society signed a memorandum of understanding on Sunday to teach vocational skills to inmates. 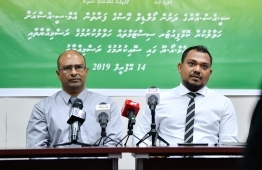 The two-year agreement was signed by Maldives Gas' Managing Director Shazail Shiyam and Commissioner of Prisons Abdulla Munaz, at a ceremony held at Maldives Correctional Service (MCS). As per the MOU, inmates will be tasked with repairing gas cylinders used by Maldives Gas. MCS stated that teaching such vocational skills to inmates will ease their integration back into society and facilitate employment opportunities for them. The inmates will receive renumeration for their work. In addition to the MOU, Maldives Gas also donated 10 computer systems to MCS under their Corporate Social Responsibility programme.